As the Creative Writing Club advisor for Spokane Falls Community College, Pullman Campus, Khaliela Wright oversees the annual publication of the Bigfoot Review. Each year the club chooses a theme, then writes stories and poems on that theme for inclusion in the anthology. In prior years the publication was only distributed to students through the school, but for the 2017-2018 school year the club made the leap to publishing for a wider audience. The Creative Writing Club’s anthologies are available at BookPeople of Moscow. Proceeds from the sale of all books are used the support the club’s future writing endeavors. 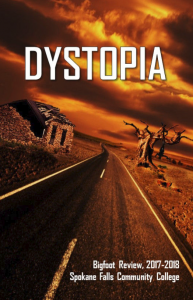 Dystopia is a collection of short stories and poetry written, edited, and compiled by students at Spokane Falls Community College, Pullman Campus. The 2017-2018 Bigfoot Review is the Creative Writing Club’s revival anthology. The club’s advisor, and short story author, Khaliela Wright, welcomes you into the diverse and vibrant fiction and poetry created by the 10 writers presenting their work in the anthology. Enter their worlds. Linger over their stories. Let their prose delight, unsettle, and entertain. You can purchase the book on Amazon in both print and kindle versions. Dystopia is available wherever books are sold. Whether they hearken from myth and legend, the evil side of religion, fantastical or sci-fi creatures with beastly traits, warlords or mass murders, or are the stuff of nightmares, we want you to bring us your monsters. 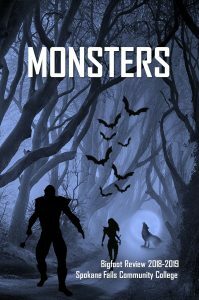 This anthology explores monsters, their roles in our lives, and ours in theirs. Submissions are open to fiction, non-fiction, and poetry, however, all works should adhere to the theme. Authors whose work is selected for inclusion will receive a copy of the book and have an opportunity to participate in a reading in May 2019. Submissions are accepted until March 1, 2019 and are open to SFCC Pullman students, faculty, staff, and affiliates. Email subject line: Your Name, MONSTERS: Your Story. Email attachment: Your work (7,500 word limit). Files must be Microsoft Word documents. (.doc or .docx) Limit of three submissions per person. Authors selected for inclusion will be notified in April 2019.